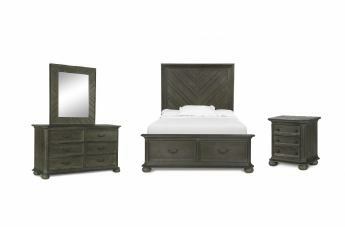 European influences marry with rustic details to create an outstanding bedroom collection in Cheswick. 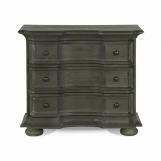 The Gustavian inspired Bachelor’s Chest is uniquely shaped with canted corners and columns. 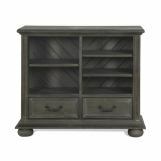 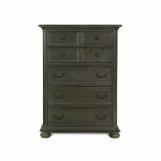 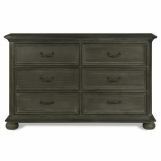 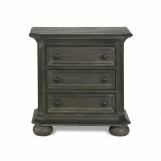 The collection is finished in a welcoming Washed Linen Grey wood that lends true antique appeal. 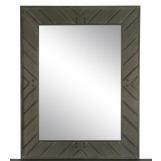 A handsome chevron pattern is created with diagonal wood planks and is accented by ornamental nailheads on the headboard of the panel bed which also boasts a recessed panel storage footboard. 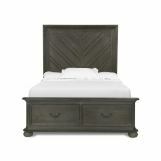 Finishing out the stunning collection is a vintage inspired, upholstered bed with a graciously shaped headboard and footboard.